The avalanche danger is CONSIDERABLE today on all aspects above 2,500' for human triggered slab avalanches up to 2-3+ feet in depth. A powerful storm yesterday added 1-2+' of new snow along with strong Easterly winds at these upper elevations. Thick slabs sitting on weak faceted snow, that did not avalanche yesterday, are teetering on the brink. Below 2,500' where wet snow and rain fell, a MODERATE danger exists for wet loose avalanches as well as the possibility of an avalanche releasing above to run into this elevation band. **Today is one of those days to let the snowpack settle and adjust. I know we are all very powder starved, but patience is the key. There is VERY WEAK snow sitting below the storm snow and large avalanches are likely to be triggered on slopes steeper than 35 degrees. These can be triggered remotely or from below and propagate across entire slopes. Sticking to lower angle terrain with nothing above you is recommended if you are headed out to the backcountry. 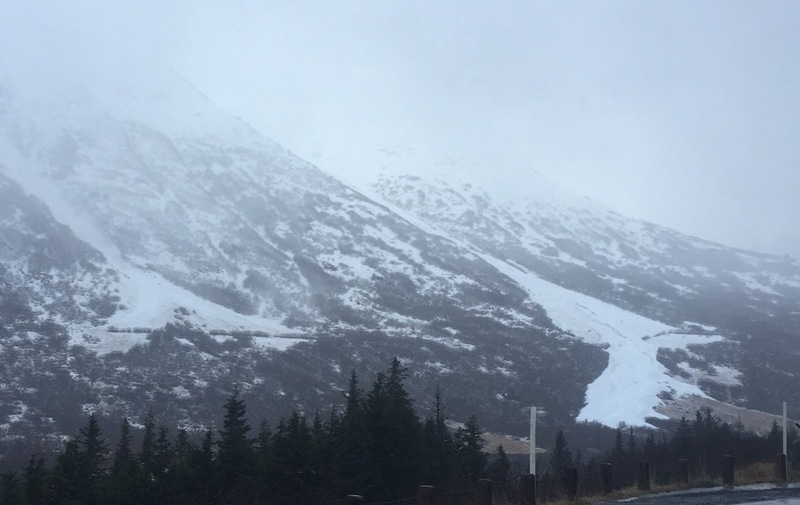 A very warm, wet and windy storm impacted the Kenai and Western Chugach mountains yesterday. Heavy rainfall was seen as high as 2,000' in places along with sustained hurricane force winds out of the East. In fact, the Sunburst wind sensor blew apart after recording a record gust of 129mph! This is an ALL-TIME high gust for the Sunburst weather station since 2008 when it was installed - the last strongest gust was 121mph in December of 2011. Total precipitation amounts during this cycle, which began Sunday evening and ended last night, add up to over 2" of water in the Girdwood Valley, ~1.5" on Turnagain Pass and just under an inch in the Summit Lake zone. Snow amounts at the higher elevations can be estimated at 1.5-2' with larger amounts North of Girdwood and in Portage and smaller amounts at Summit Lake. As one might expect, widespread natural avalanche activity was seen with this event. Most of the activity began as dry slab avalanches above 3,000' that entrained heavy wet snow on the descent. Due to the thin snowpack to start with and no snow below 1,000', these slides only reached sea level in certain channeled paths; most areas did not have enough volume to run full length. Below are a few images of what we were able to see with yesterday's low visibility. Matt Murphy with the ADOT&PF Avalanche Program (and former CNFAIC avalanche forecaster) gets the winning picture yesterday with this large avalanche in motion - you can see the powder cloud clearly in the left photo. This is at Mile 52, Moose Mtn, just South of the Hope Y. On the right is the debris after the avalanche. Here is one more picture of an avalanche that made it to sea level - this is Peterson #2 slide path just a few miles South of Girdwood. With yesterday's storm moving off, winds dying down and skies clearing, natural avalanche activity will decrease as well. However, this is the prime time for human triggered avalanches. The snowpack needs time to adjust - especially where the snow is the best at the upper elevations! Under the past week of snowfall, around 2-3' deep now, there sits a widespread layer of weak (sugary) faceted snow. This weak layer is keeping the new snow from, essentially, sticking to the mountain sides - nothing any of us want to deal with, but it is there nonetheless. Red flags such as cracking and collapsing are likely to be found along with the ability to trigger an avalanche remotely or from below that can slide on top of you. It is not rocket science as Fitz pointed out yesterday, avoiding slopes over 35 degrees or steeper is again the take home for today. With wet and soggy snow at the treeline elevations below 2,500', wet loose avalanches will be possible to trigger on steep slopes and gully sidewalls. There may be a bit of a re-freeze limiting this type of avalanche, but considering the danger at the higher elevations in the dry snow and uninspiring wet snow below, it's a good day to save your gas $, stay in town and not cash in your powder sick day yet. Yesterday saw a return to what is becoming this season's signature precipitation event - warm southerly flow associated with a large North Pacific low. Once again, rain fell as high as 2,000' and possibly higher in some locations - although, it could be worse! Precipitation numbers for the past 24-hours are in the table below and as mentioned above, water numbers for the entire storm were in the 2" range for Girdwood, 1.5" for the Pass and 0.7" for Summit lake. Ridgetop winds, also mentioned earlier, were hurricane force from the East with averages in the 60-80's mph. Temperatures were mild with ridgetops in the mid to upper 20's F.
Overnight, the storm has moved North and skies are clearing. For today, we should see partly cloudy skies and no new precipitation. Ridgetop winds will continue out of the East in the 15-20mph range while temperatures will slowly decline to the mid 20's F at 4,000' and 32F at 1,000'. A short wave ridge moves through Wednesday and Thursday allowing for mostly clear skies before another warm and potent storm looks to hit us on Friday. Stay tuned. *Sunburst wind numbers are from 6am-11am until the anemometer blew apart - 84 averages to 129 gust.